My jaw dropped when I started reading The Independent’s review of the Mansion House speech yesterday morning. On the front page of their website they showed a picture of George Osborne, the UK Chancellor of the Exchequer, in full flow delivering his speech. 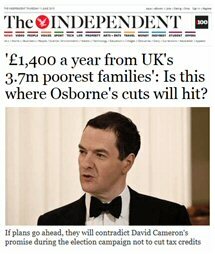 Alongside was a headline that said “£1,400 a year from UK’s 3.7m poorest families: Osborne reveals who cuts will hit”. Wow, I thought. How could Osborne follow up Cameron’s “one nation” speech by telling a group of highly-paid financiers that he was going to cut benefits for the poor? Then something strange happened. When I returned to the home page some time later, the headline had changed. It now read: “£1,400 a year from UK’s 3.7m poorest families: Is this where Osborne’s cuts will hit?” In the early afternoon, I returned to The Independent home page a third time. This time the headline had been removed altogether, but older stories were still there. This entry was posted in Journalism and tagged Jung, Mythology on 12 June, 2015 by Steve Myers.